“Country…oops strike that “Ham and Biscuits with Red Eye Gravy”. A true country ham – the meat of which is mostly hip and thigh is one that’s been dry cured in salt and sugar for several weeks, then smoked for another few weeks, then aged for months. Country ham is in some ways similar to Italian uncooked prosciutto, but prosciutto is not smoked and is usually moister than a country ham. BUT to prepare a “true meal” from this ham takes time and a lot of work. You scrape all the salt, seasonings, mold and cobwebs off then soak the ham for 24 hours changing the water frequently – now who on earth has time for that, well… my husband for one. Jeff is a purest, who lived in North Carolina and calls the recipe I am going to present sacrilegious. I am a simple girl who grew up in the Pacific Northwest and well, I thought it sounded really good and quite frankly easy enough for my wheelhouse. Enjoy! 1. Bake refrigerated biscuits according to package directions. 2. Blot Han steak with a paper towel until dry and sprinkle each side with brown sugar. 3. Heat a large, preferably cast Iron skillet, over medium heat and melt butter. Brown ham slice(s) well on both sides. Remove from skillet and keep warm. 4. Add coffee, chicken broth and mustard to the skillet and bring to a boil until slightly thickened, but it will be very thin. Season with salt and pepper to taste. 5. 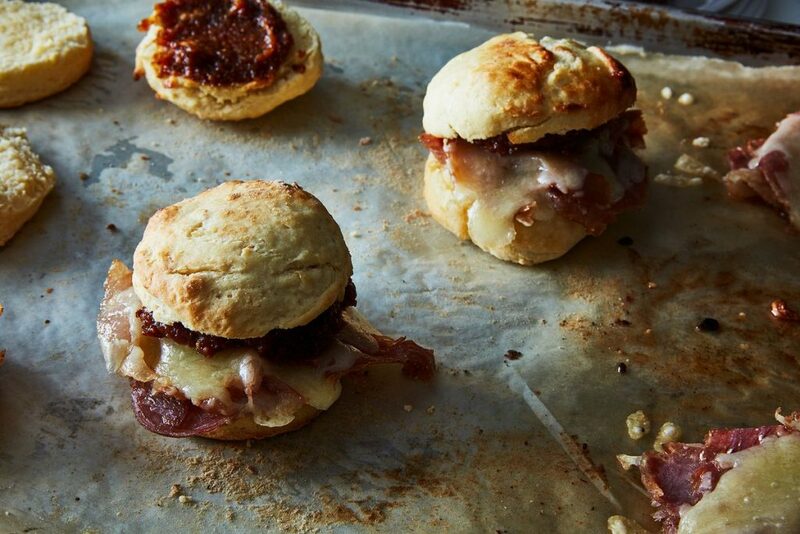 Serve ham and gravy on sliced hot biscuits.